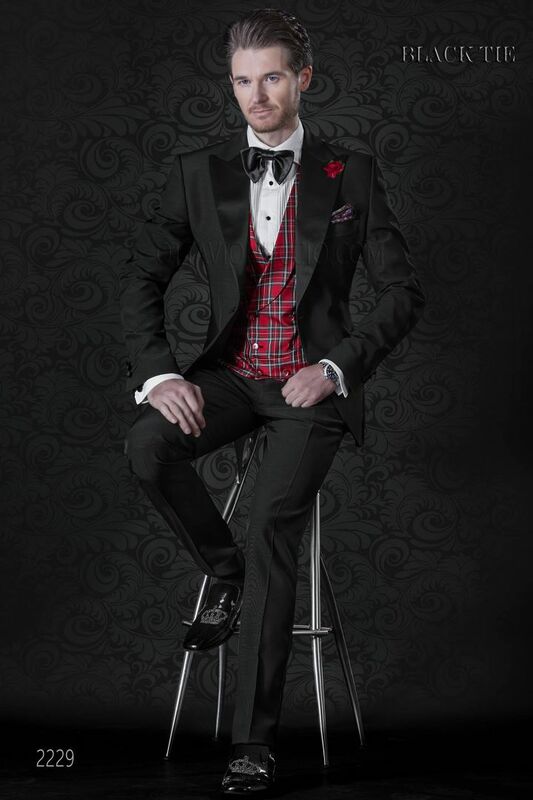 Black wool blend groom tuxedo. Peak satin lapel in contrast and 1 covered button in contrast on the front. Straight jet ... Black wool blend groom tuxedo. Peak satin lapel in contrast and 1 covered button in contrast on the front. Straight jet pockets with contrast fabric details and 3 covered buttons in contrast for each sleeve. Back side with no vents to better wrap hips; length of jacket is suitable for any height. Double-Breasted waistcoat in pure silk in red tartan with shawl collar, 6 mother-of-pearl buttons closure.